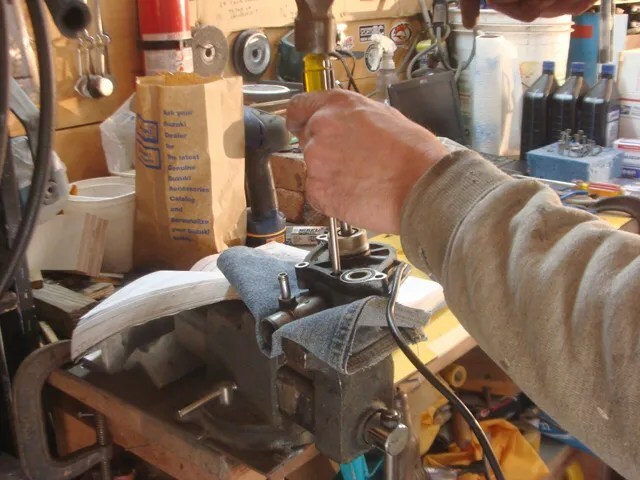 Sunday morning, April 3, 2011, I began my dash for the finish line of my modifications and repairs for the upcoming riding season. 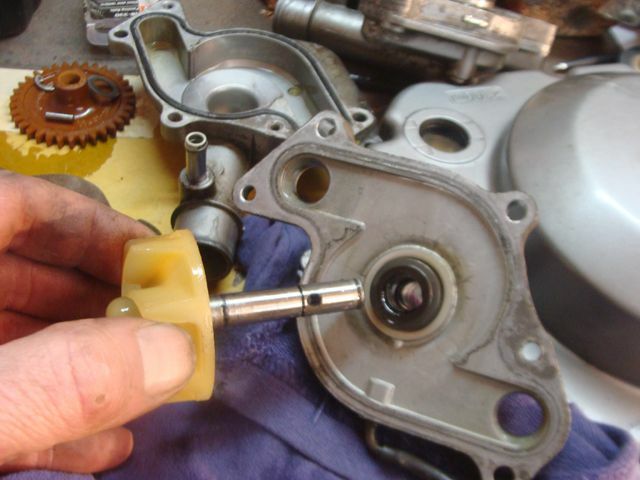 With the fuel pump completed, it was time to dig into the water pump. 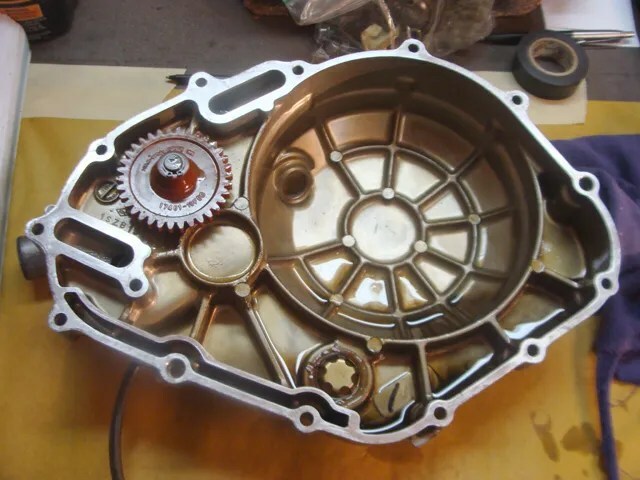 Because the clutch cover has to be removed to access the “guts” of the water pump, I wanted to make sure that all of the surfaces around the “split” in the engine case were clean, and free of sand and dirt, that might fall into the motor during the process of dissembling it. 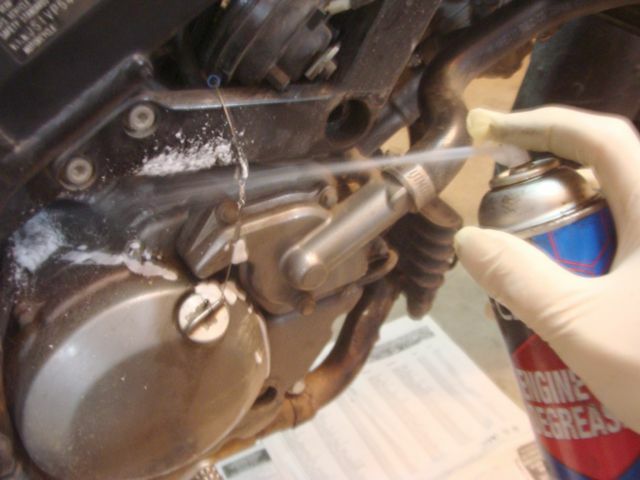 I gave the area a good shot of engine degreaser. 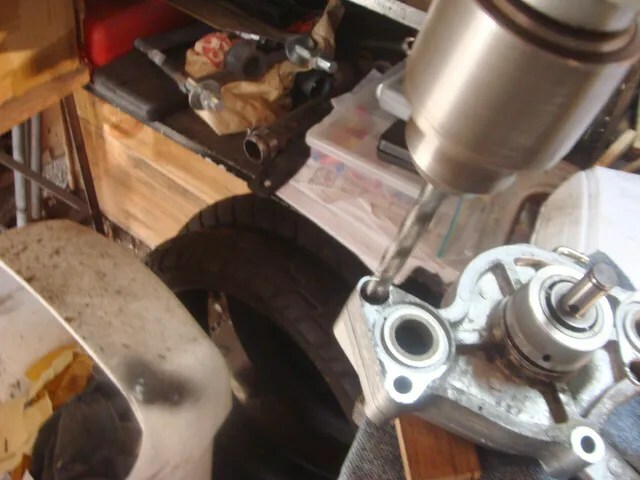 With much poking around with a toothbrush, and a screwdriver wrapped in a rag, I ended up with a motor that looked clean enough to be presented to the headmaster of a Catholic school. 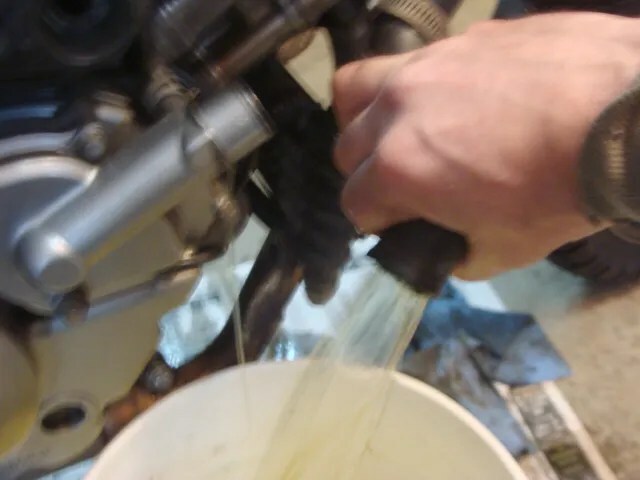 I needed to drain all of the coolant out of the radiator and the motor. 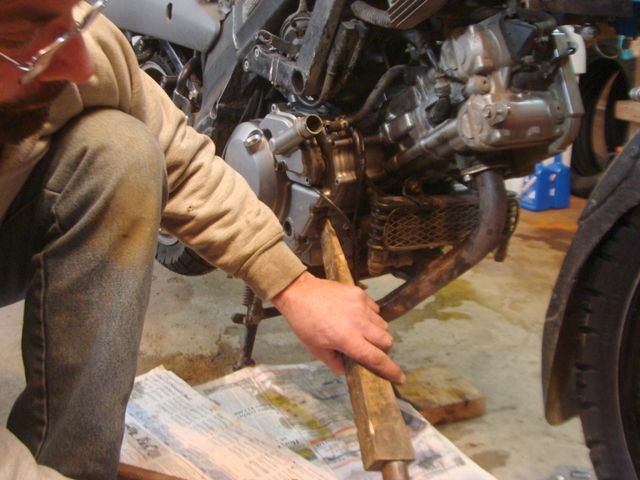 I started with the removal of the radiator. 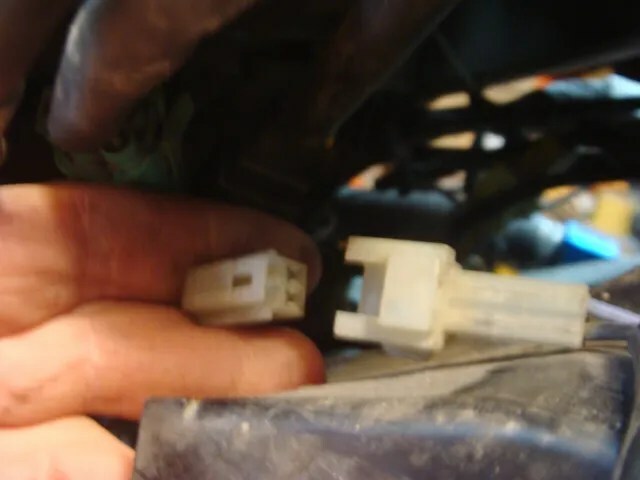 I disconnected the radiator fan switch…. …..and the fan’s electrical connection. 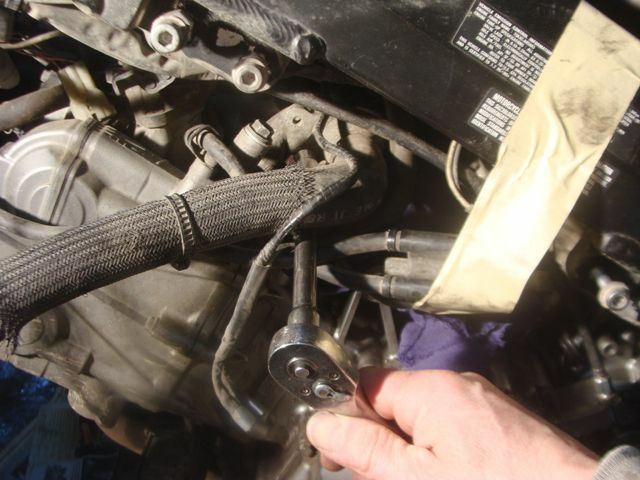 I loosened and removed the hose from the left side of the radiator. Then, I removed the thermostat housing cover underneath the airbox……. 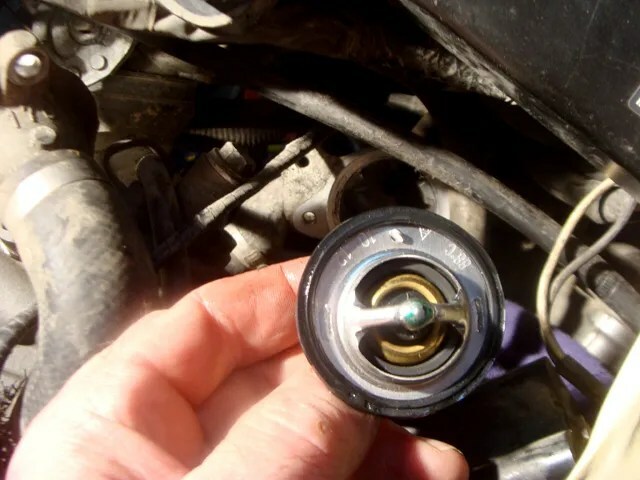 While there, I installed a new thermostat and refastened the thermostat housing. 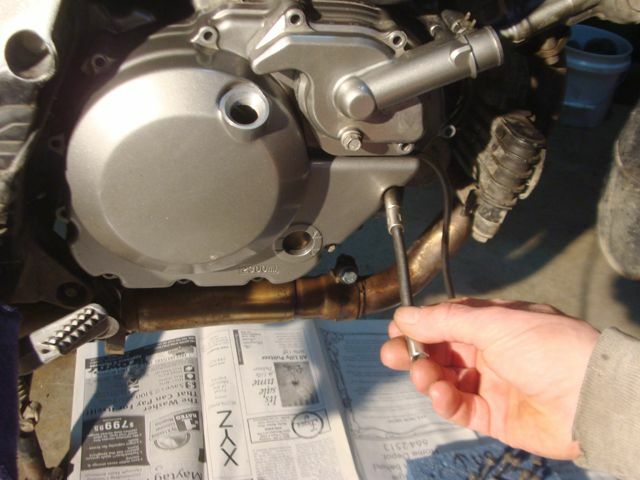 Finally, I removed the radiator from the bike. I held it over a bucket and flushed it out with well water. 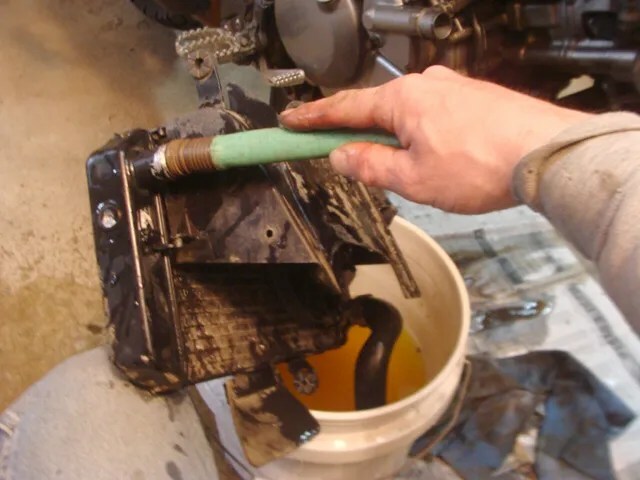 Next, I drained the motor oil from the crankcase. 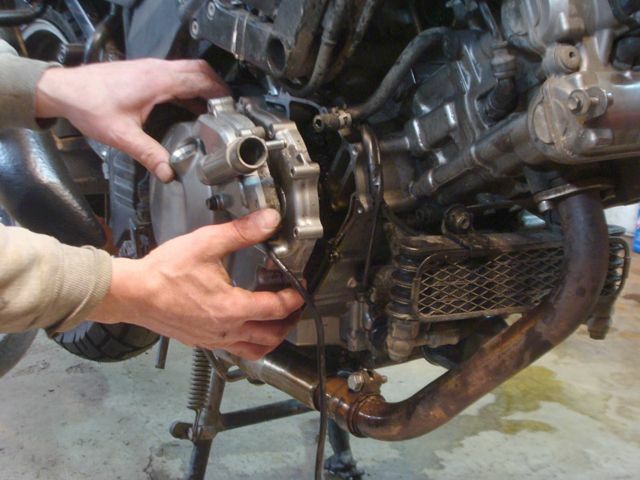 ….and reinstalled the oil drain plug into the bottom of the crankcase housing. 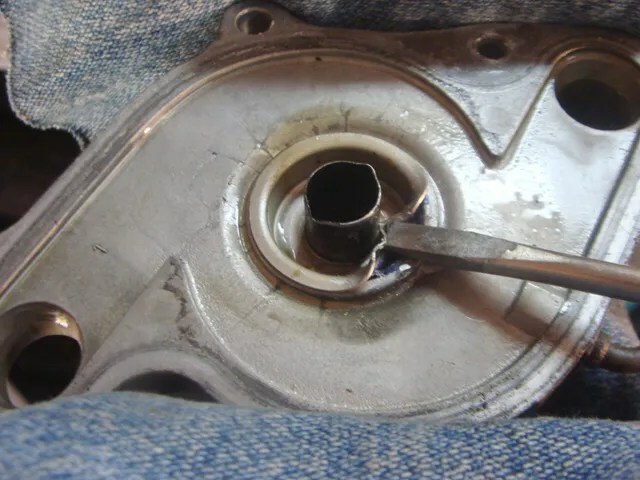 With the engine coolant and engine oil drained out of the motor, I could now move on to removing the clutch cover from the side of the motor. 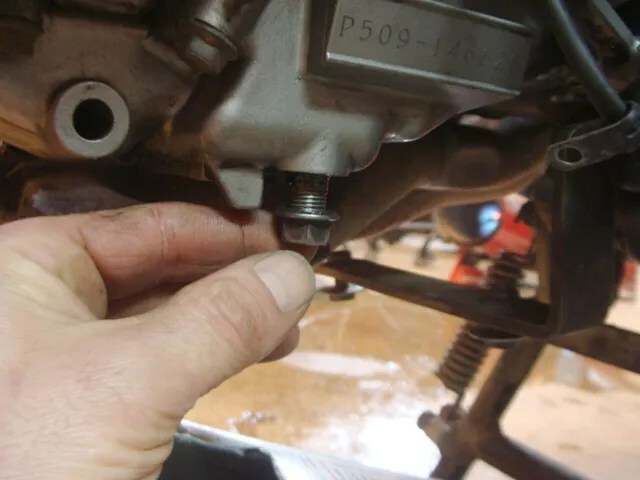 After studying what needed to be done, I decided to tackle what looked like the most difficult bolt to remove first. It is the one that is behind the right driver’s footrest. My flexible extension would not do the trick. 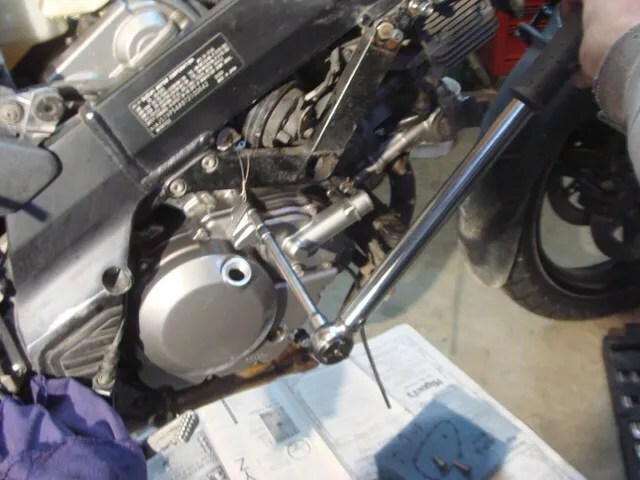 However, I found that if I removed the forward footrest bracket screw, and loosened the aft one, there was enough “play” in the bracket to position it out of the way, to allow a regular 6″ ratchet extension to make it to the “hidden” bolt. 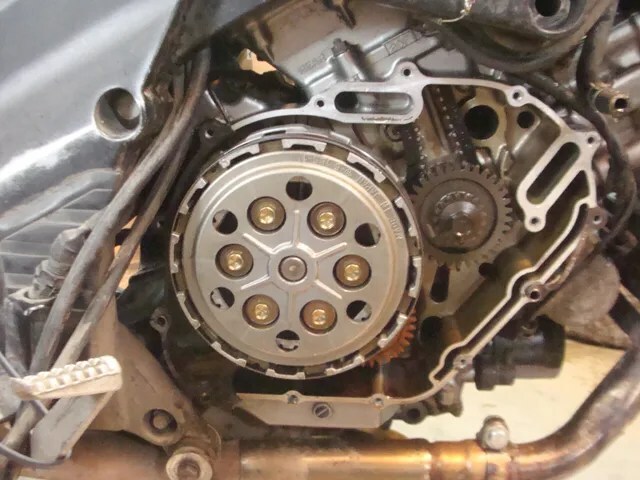 I worked my way around the clutch cover, loosening all its fasteners. 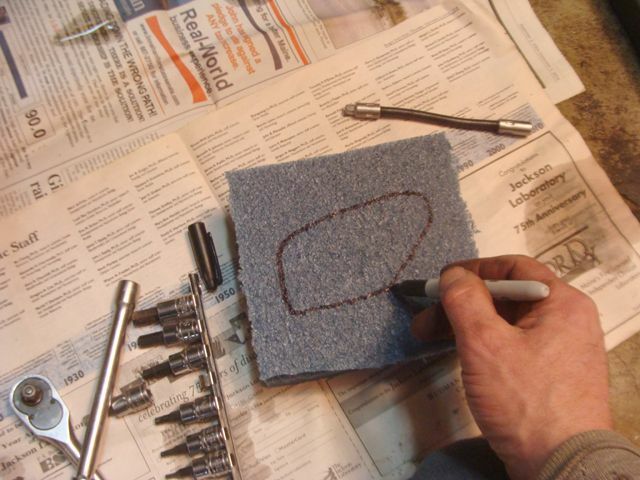 Before actually removing the clutch cover bolts, I scrounged up a scrap piece of foam I had lying around, and traced out a very rough illustration of the clutch cover with a Magic Marker. Then, I began to remove the bolts, one by one, and as I did so, I jammed them into the block of foam; roughly in the location that corresponded to their “home” in the clutch cover. In case I kicked the block of foam with the toe of my boot……., I decided to add more description to it. 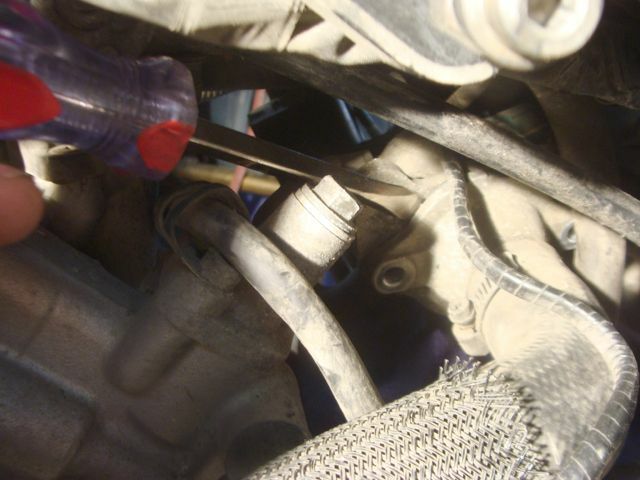 I then removed WTIC #2 drain tube from its clamp near the oil sensor. 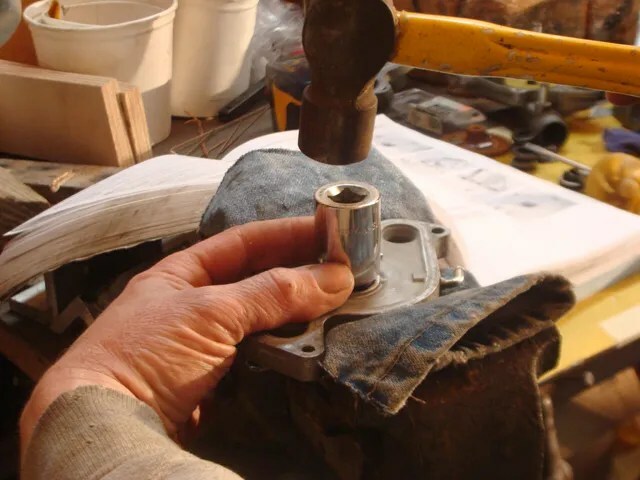 With all of the fastenings removed, along with any remaining WTIC items, I grabbed one of my wooden wedges and a hammer, and “rapped” on the clutch cover to jar it free from the engine case. (Please keep in mind, that I haven’t a clue as to what I am doing, and I have never done this type of stuff before!). 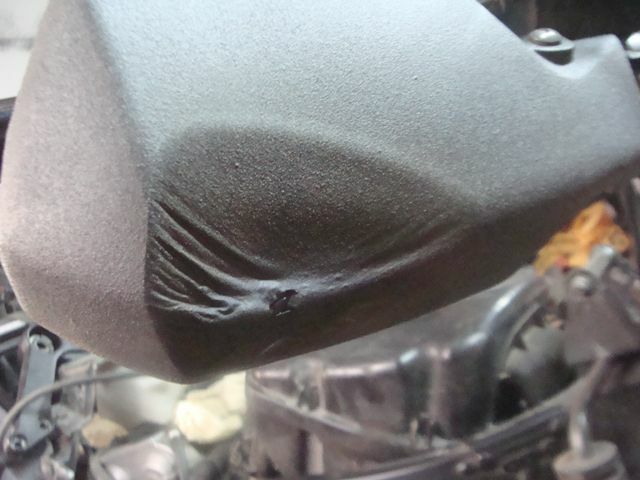 Beating on the clutch cover with a hammer seemed to work. It is always surprising to me just how many “broken” things can be fixed by beating on them with a hammer. Screaming and swearing at them also works from time to time, but not as good as beating them with a hammer. 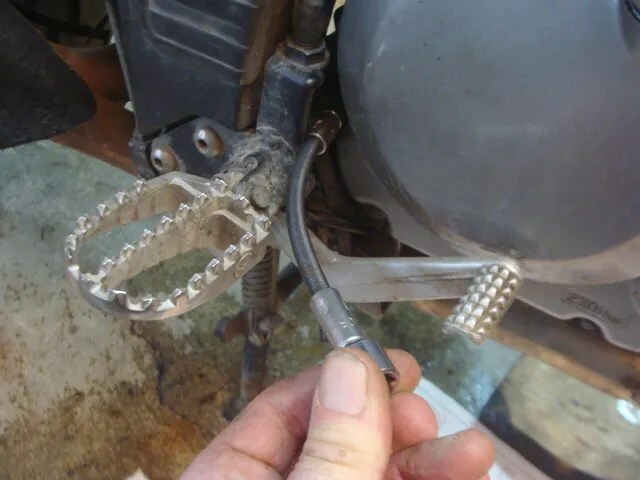 I discovered that I could not get the clutch cover out past the right footrest, so I ended up removing the aft bracket screw as well, and tying the bracket/footrest clear of the clutch cover. Tadah! There is the clutch cover sitting on my garage floor. 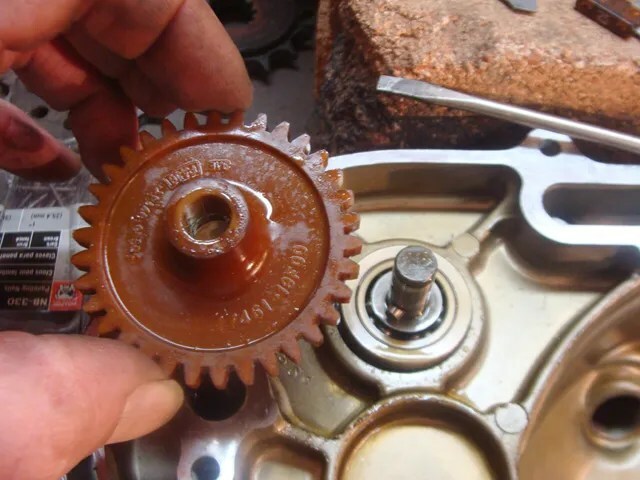 The “brownish” colored cog is the gear that operates the water pump. 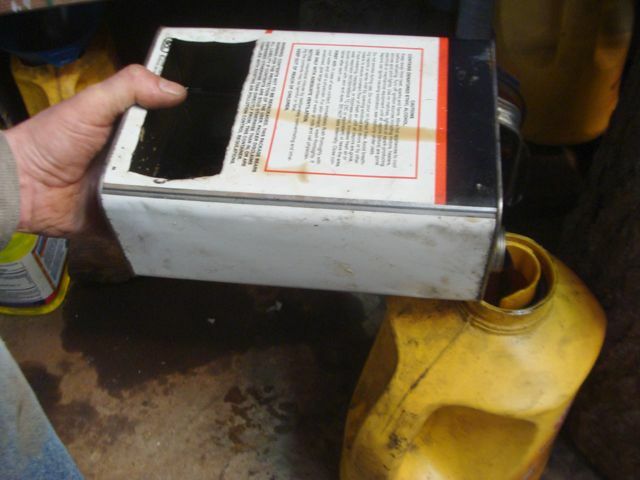 To access the “guts” of the pump, you have to do it from the engine side. 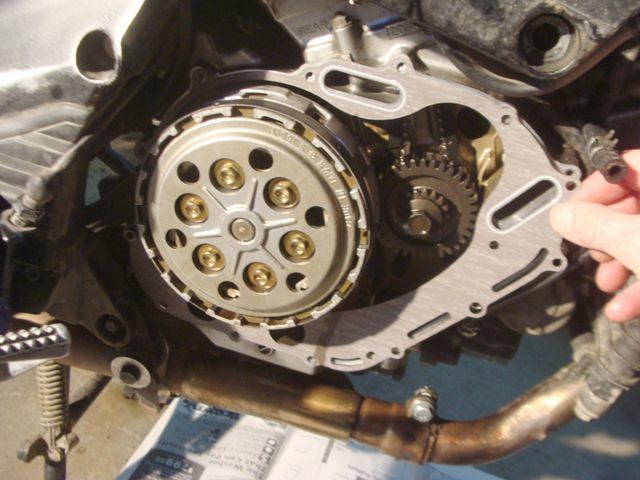 To rebuild a water pump, this is why the clutch cover has to be removed from the engine housing. 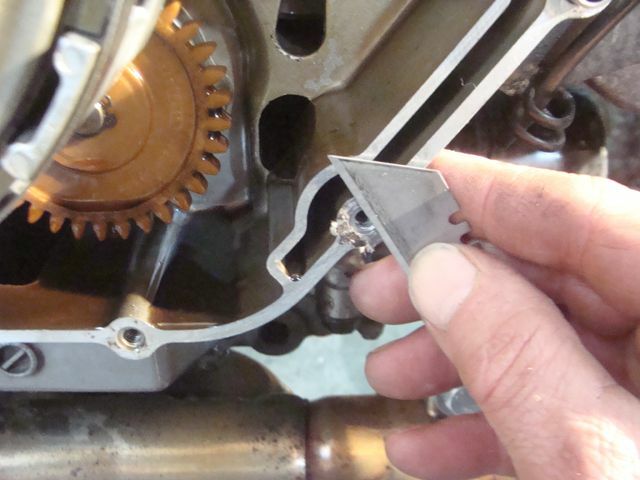 Using a brand new, utility knife blade, I very carefully “shaved” off what few bits of gasket remained stuck to the motor housing. 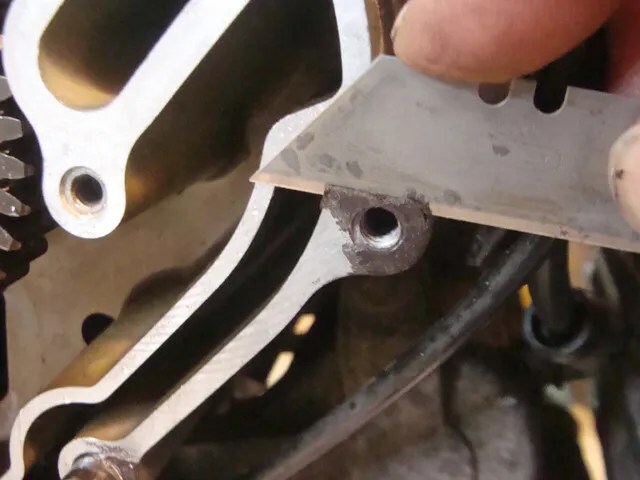 Of course, there is always a bolt, or a piece of gasket that is nearly impossible to remove when you are working on motors. 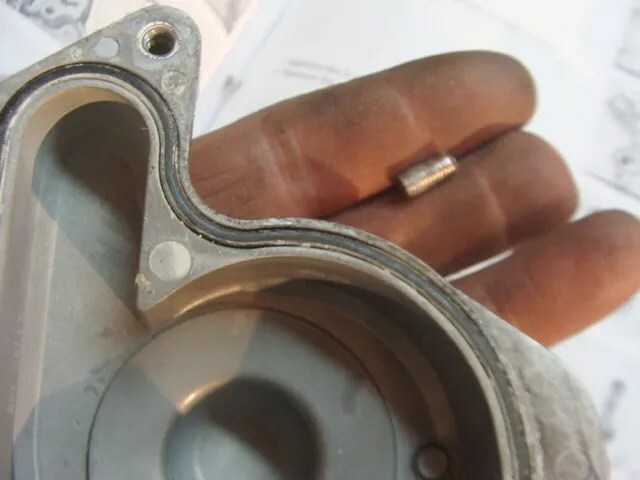 This section of gasket was very difficult to get at! I had to break off pieces of utility knife blade to sneak in there to do my “shaving”. 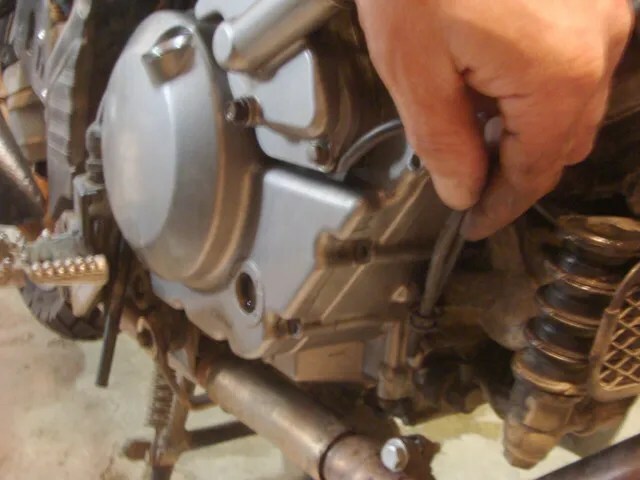 Screaming and swearing at myself, over the years just hasn’t “fixed” me yet. Next time, (And, oh there will be a next time! I can always count on myself for being a dumb dork! 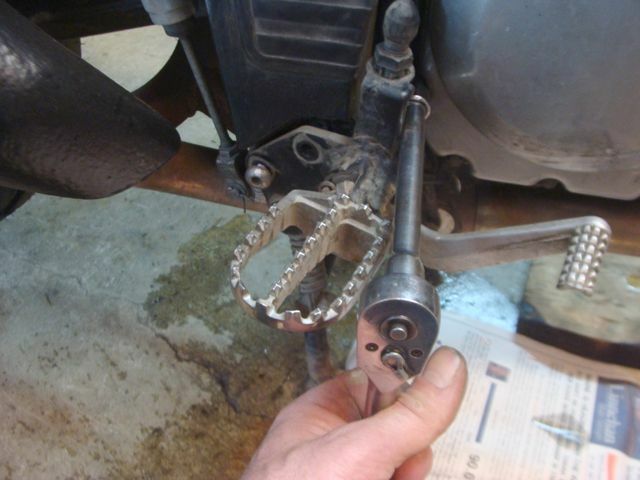 ), I think I will skip the screaming and swearing at myself, and just go right for the hammer…….. I will fix it later. Probably with some more steel. 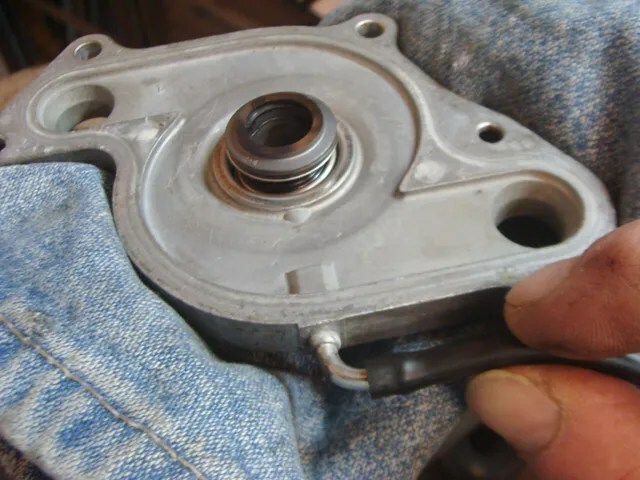 With the excess gasket shaved off of the engine, and clutch cover surfaces, (there was not much), I could now tend to removing the water pump from the clutch cover. I found two annular ringed, “panel nails” on one of my storage shelves. 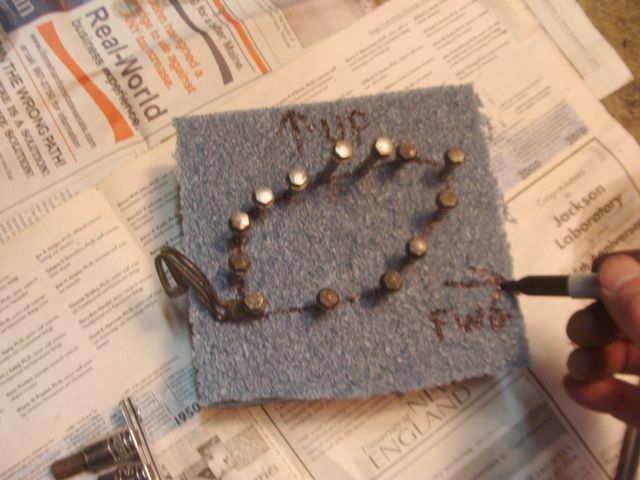 I placed the tips of the nails into each hole of the circlip, and then “crushed” the heads of the nails together using a pair of vise grips. 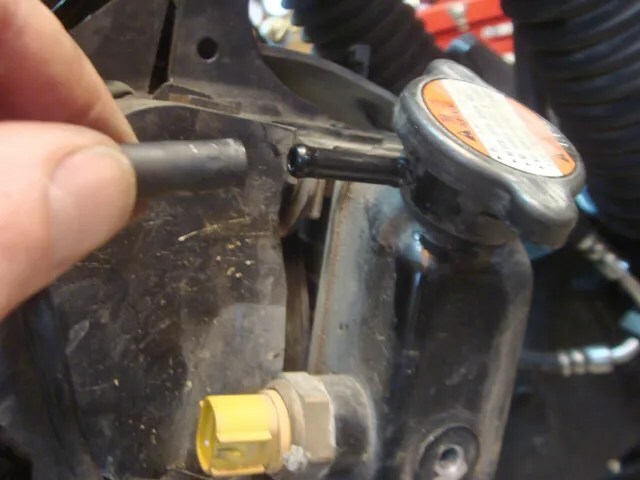 I jammed a flat blade screwdriver between the two nails, and twisted the screwdriver “flat”; spreading the nails apart and forcing the circlip off of the pump shaft. 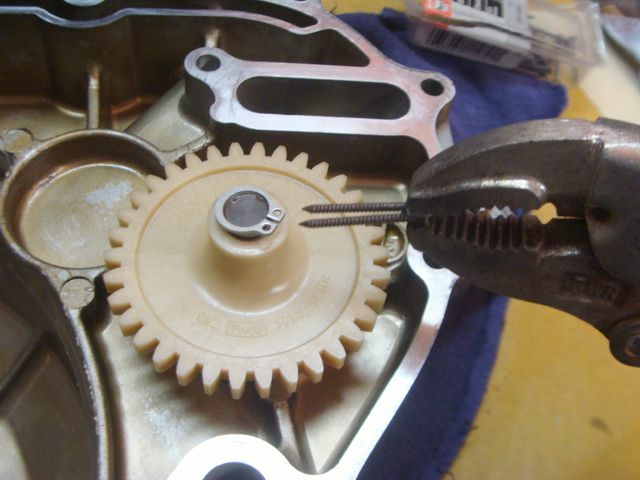 I lifted off the pump gear…..
Next, I pried off the snap ring from the pump shaft…. 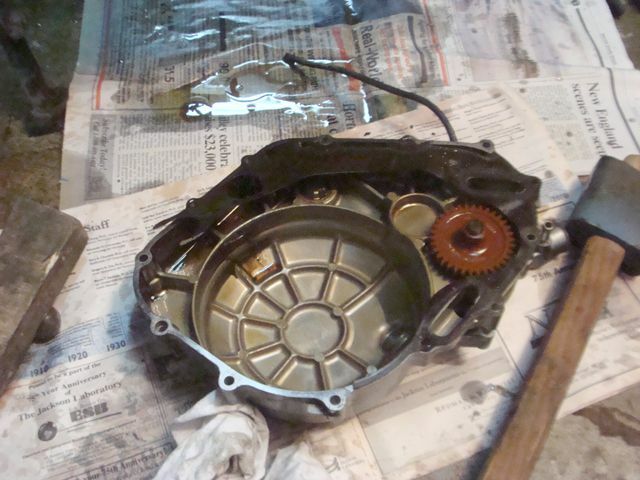 ….then, flipped the clutch cover over and removed the water pump from the clutch cover. 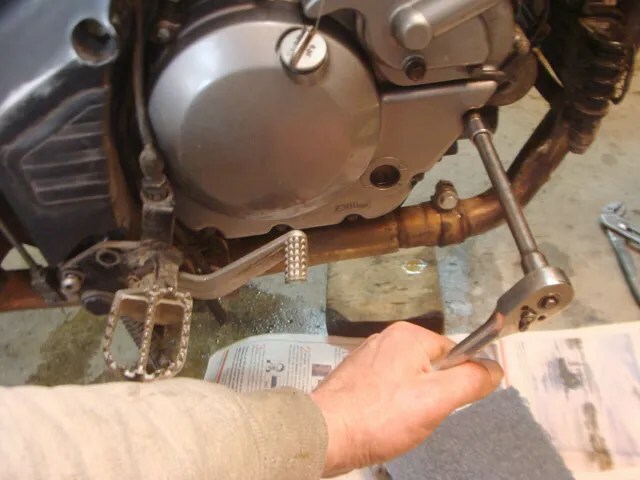 After successfully removing the water pump from the clutch cover, I decided to take a break from forward movement, to buy me some time to think about the next few steps I was going to take. 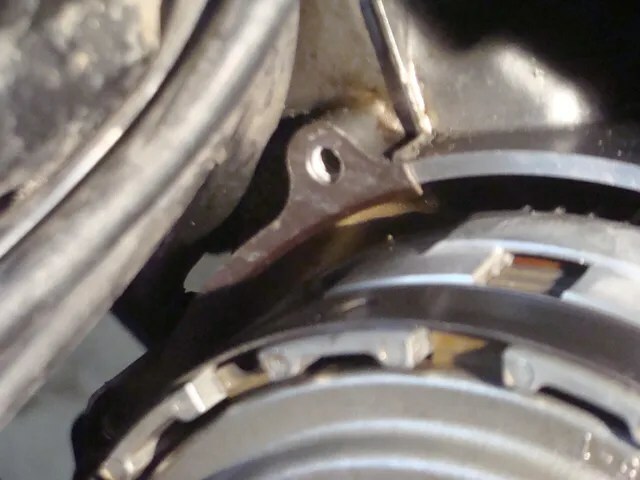 So, I picked up a piece of utility knife blade, and began to clean the area of the clutch cover where the water pump mates to it. This task allowed me some mental “down time”. (Or, stress relief…….). What you are looking at here are TWO water pumps. The one that I am holding in my hand belongs to a riding friend of mine; a GOOD Friend! 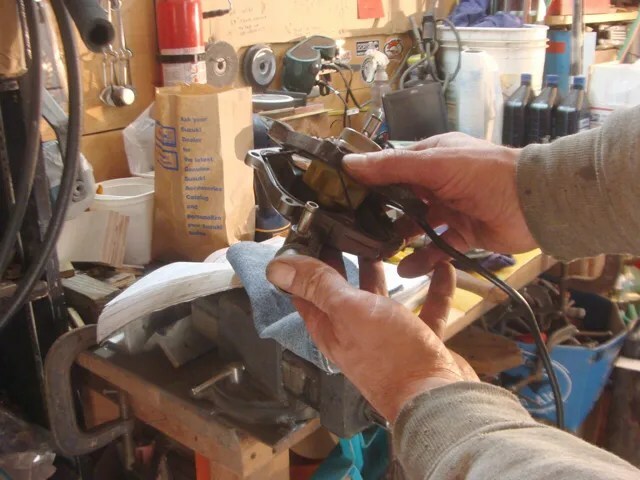 He donated an old DL-650 water pump that he had on hand, to my cause. 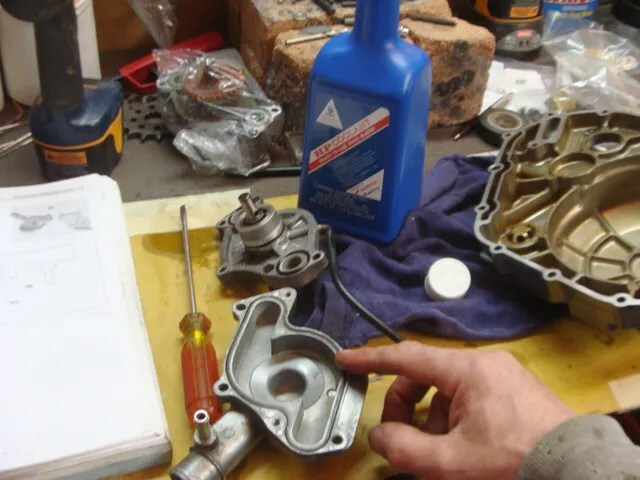 The water pump sitting on the bench top, in the background, belongs to me. 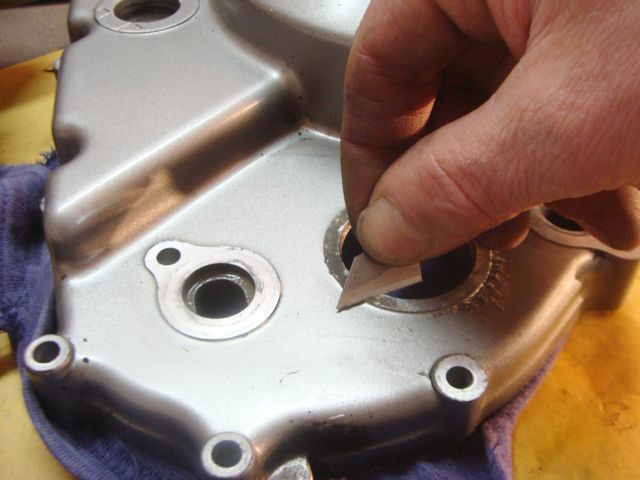 There are two phillips head screws, that need to be removed, to enable you to split the pump housing apart. Of course, the screws are steel and the pump housing is soft aluminum. That often is a bad combination! 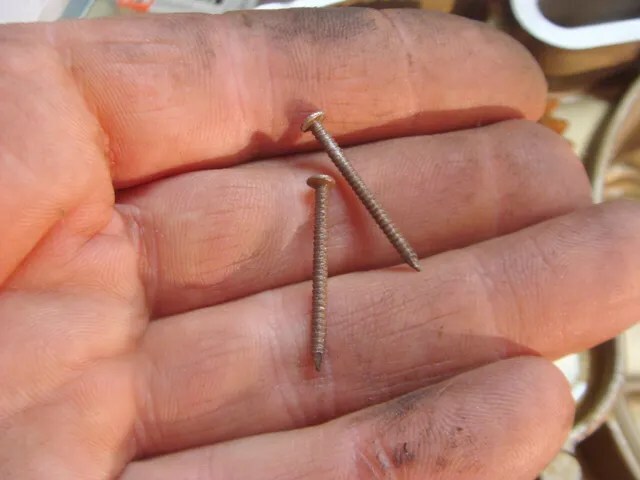 I believe the torque specification for these two screws is 3 lbs. 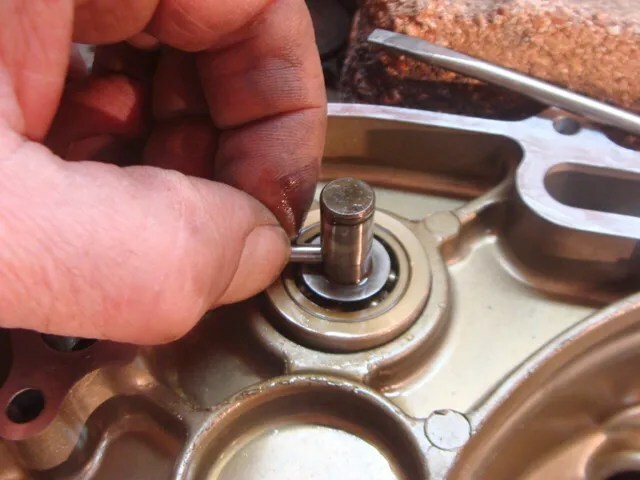 I will tell you right now, the screws may have been tightened with 3 lbs of torque, but they loosen with about 70 lbs of grunt! I was SO scared of stripping out the heads of the screws. I don’t have an impact driver, so I relied on the old fashioned way; a hammer and a phillips screwdriver. I tapped the screwdriver with the hammer, and “twisted” the screwdriver as I did so. I ended up putting nearly all the muscle I had into breaking these two screws free! 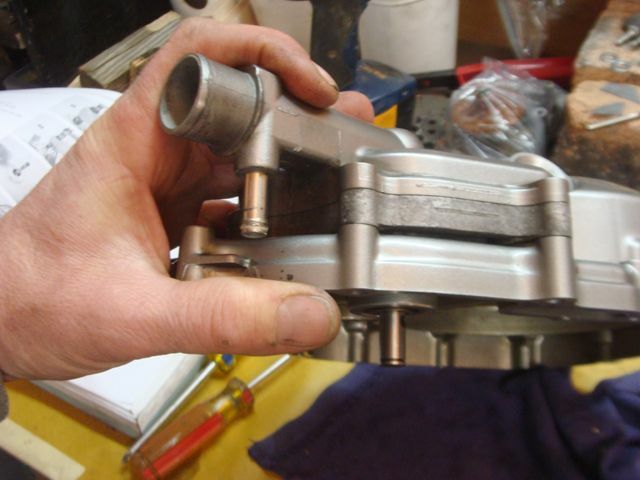 Here is the pump housing being separated. 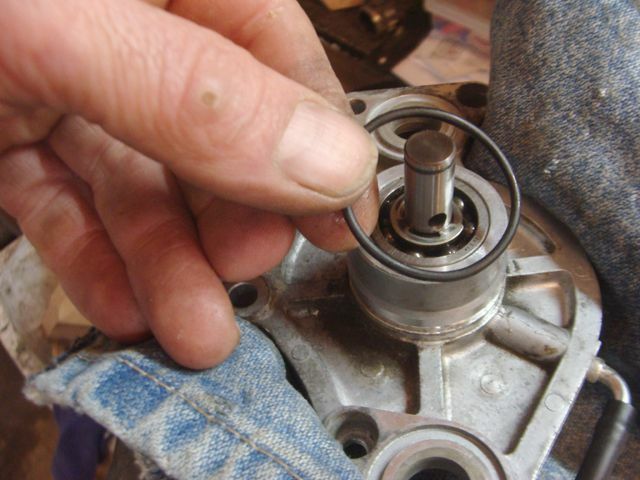 Once separated, I removed the impeller to have a “look see”. 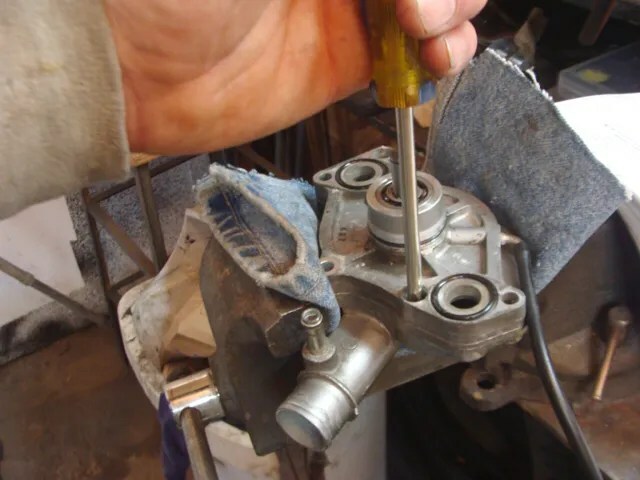 So, now it was time to split my friend’s water pump housing apart. The first screw came out after some difficult persuading. 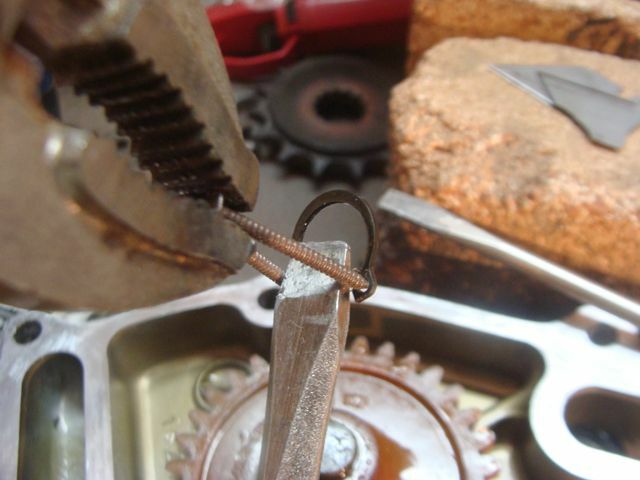 The second screw…….. 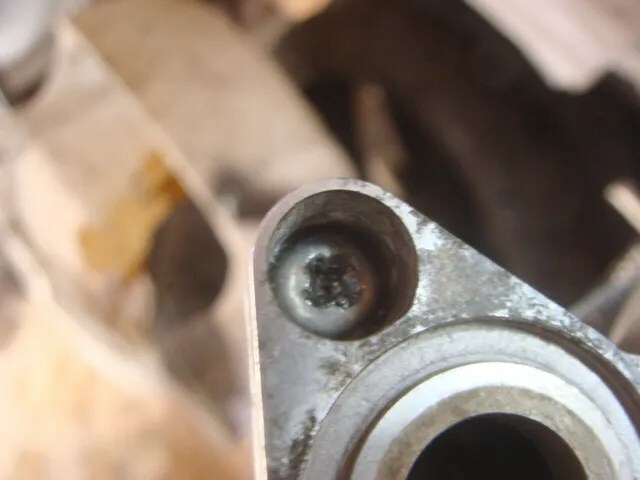 Here is the “buggered” screw. I chucked up a drill bit into my drill and cut my way down to approximately the base of the head of the screw. 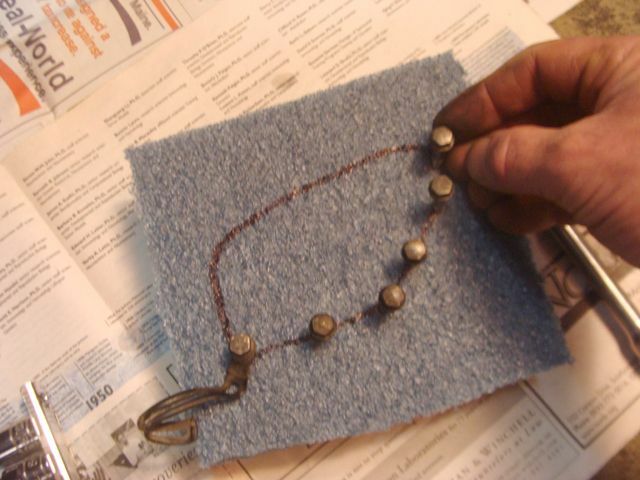 Then, I chucked up a drill bit that was about the same diameter as the body of the screw, and drilled down some more. 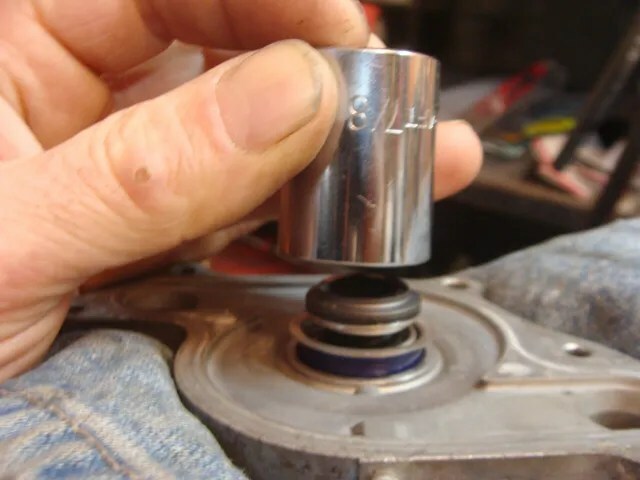 The “V” of the larger bit, became the “centerpunch” guide for the smaller bit. 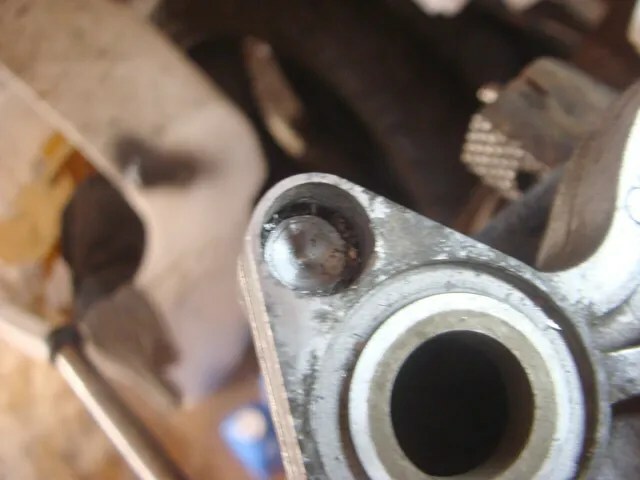 After guessing that I had drilled far enough, I slid a screw driver between the two halves of the pump housing, at the end that had the screw already removed. 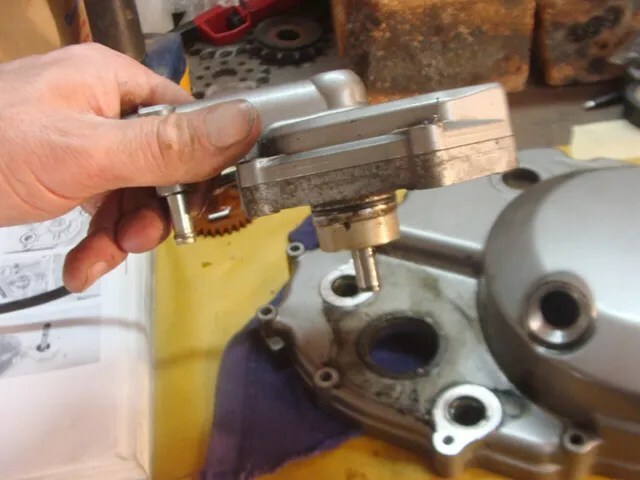 I pried up with the screwdriver just enough so that I could spin the two halves of the pump housing past each other; clearing the o-ring gasket that seals the two halves together. 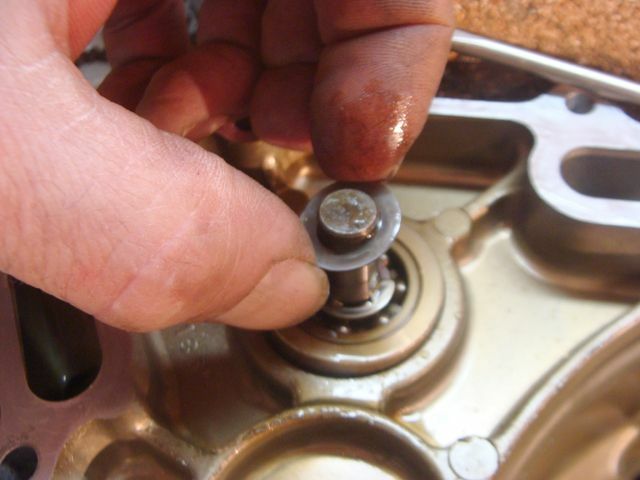 Once apart, I could unthread the offending screw with my fingertips. 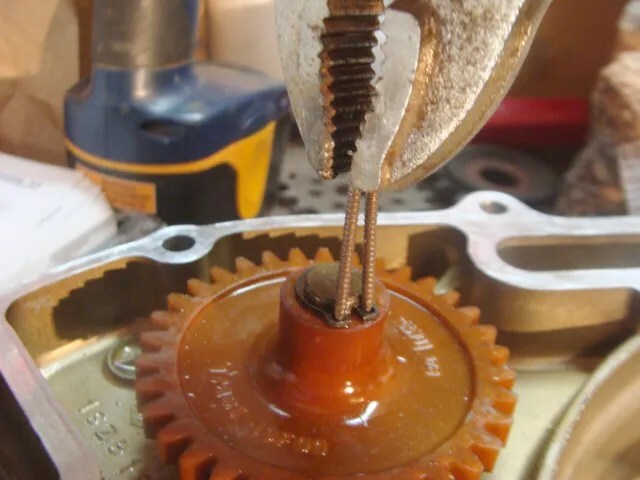 The problem with the stuck screw is underneath the screw’s head and not with the threaded portion. There is a mechanical seal that is pressed into the pump housing. 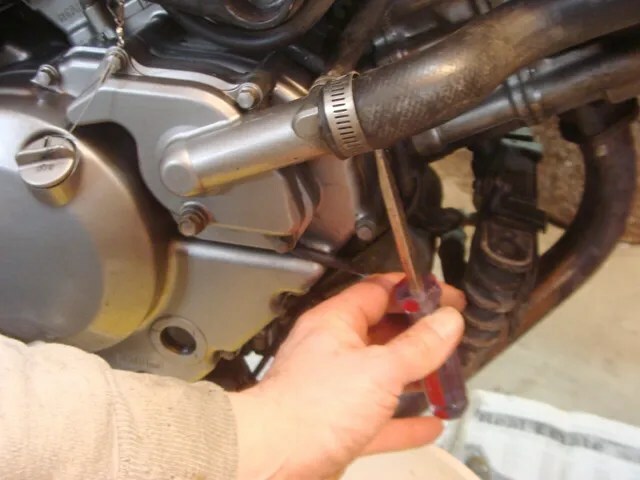 When removing an old one, you are only going to be able to “pull out” the “rubber” portion with your fingers. 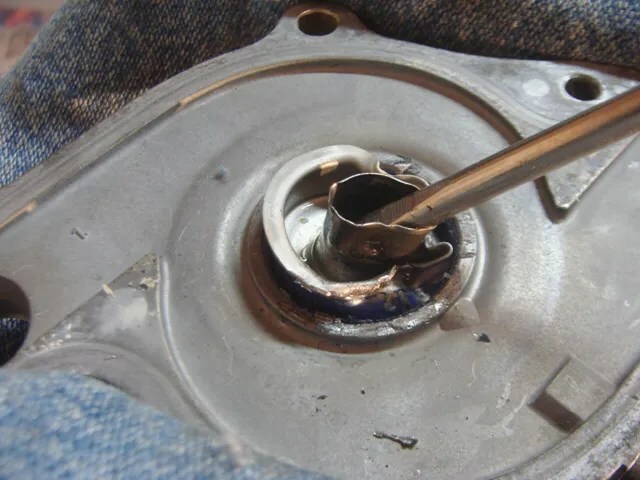 I know, because I tested the removal of it on both water pumps. 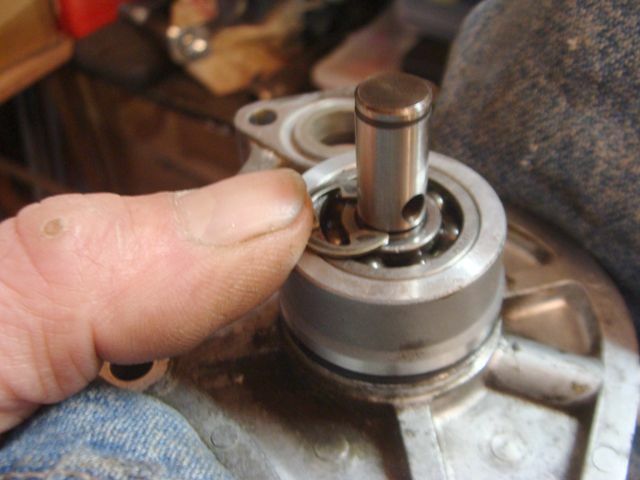 In the photo below, what I am holding between my fingers is a new mechanical seal. 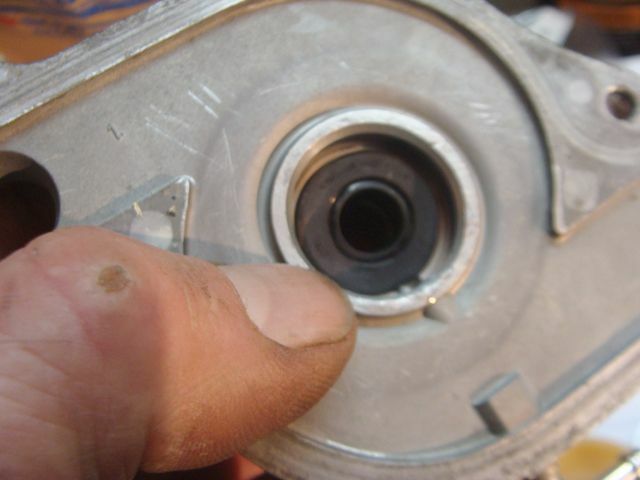 What is resting on top of the pump housing is the “rubber” portion that I am talking about. 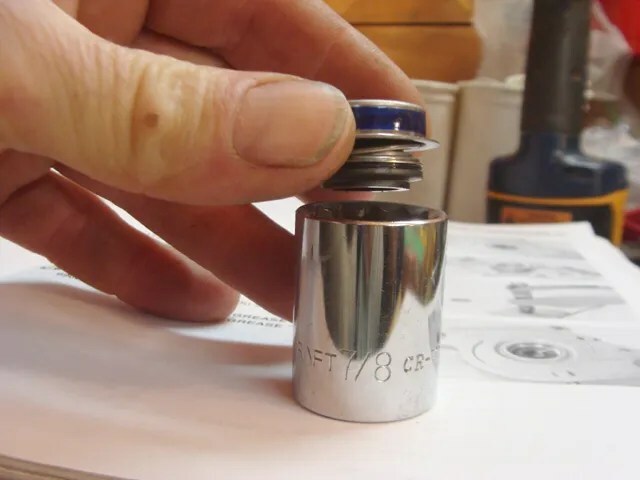 The “metal” portion of the seal is still pressed into the housing. 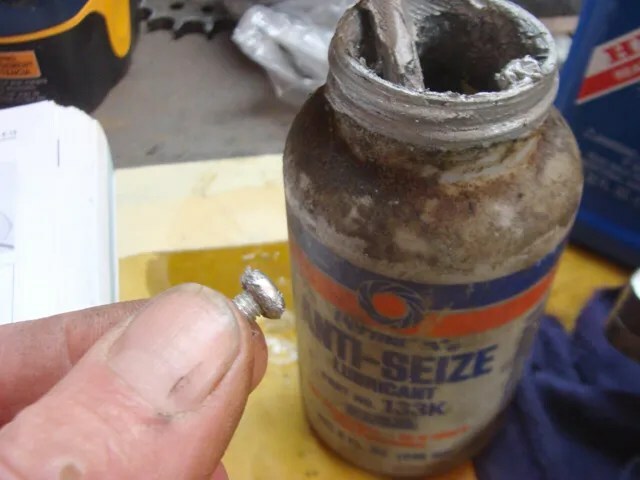 The only way that I could figure out how to remove the metal portion, was to do it VERY carefully with a screwdriver and a hammer. 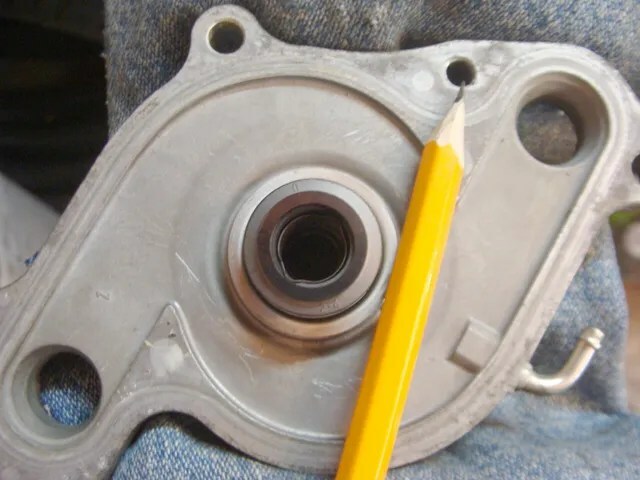 I practiced on my pump housing/mechanical seal first. 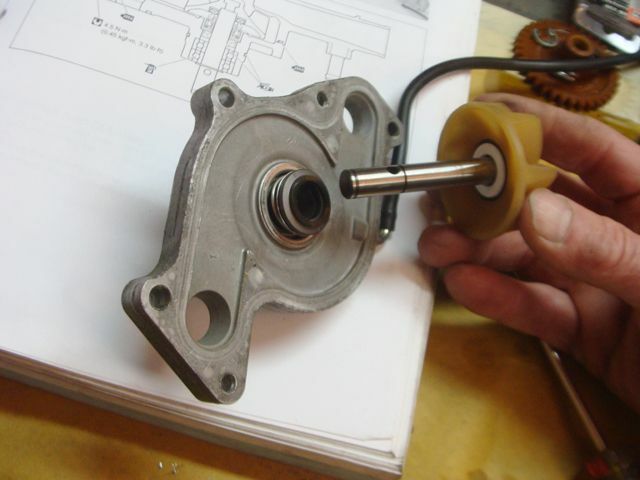 Then I made my attempt at the new pump’s mechanical seal. I was successful. But, the aluminum housing is VERY soft!!! I did make some slight nicks in it, so I dressed up the area with a mill file. 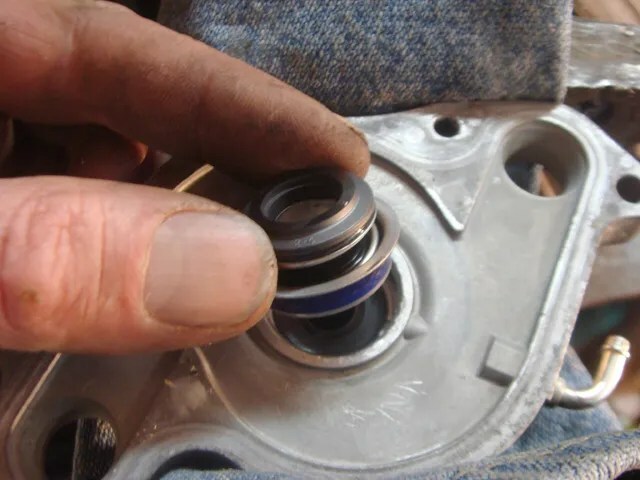 I removed the old oil seal and installed a new oil seal. 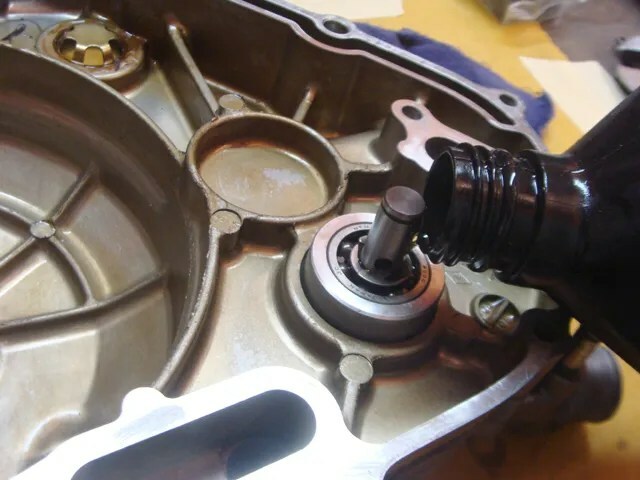 Next, I needed to install the new mechanical seal on top of the oil seal. 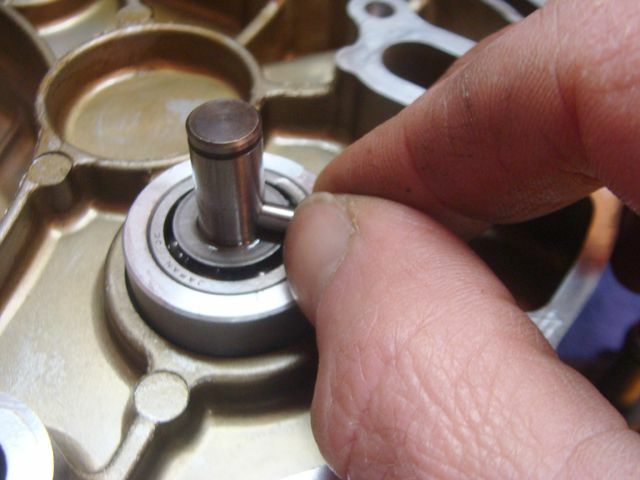 A 7/8″ socket fits nicely over the mechanical seal. 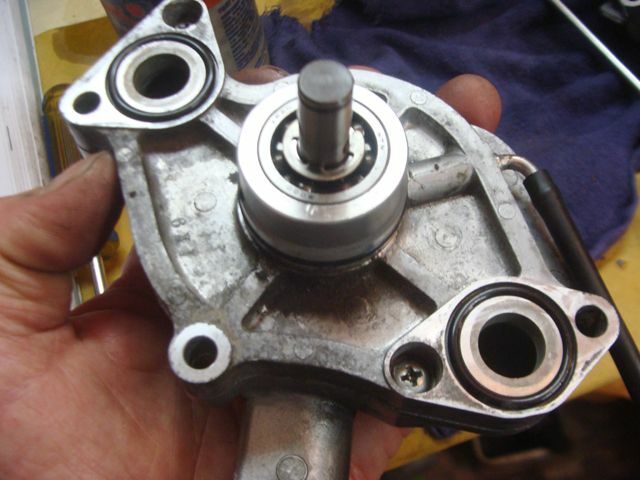 Before removing the mechanical seals from BOTH pump housings, I studied their orientation before removal. Both seals have a “keyhole” shape to the inside of them. The “slot” is aimed towards the hole that my pencil is pointed to. …and tapped the seal home. I slipped the WTIC #2 hose onto the pump housing. 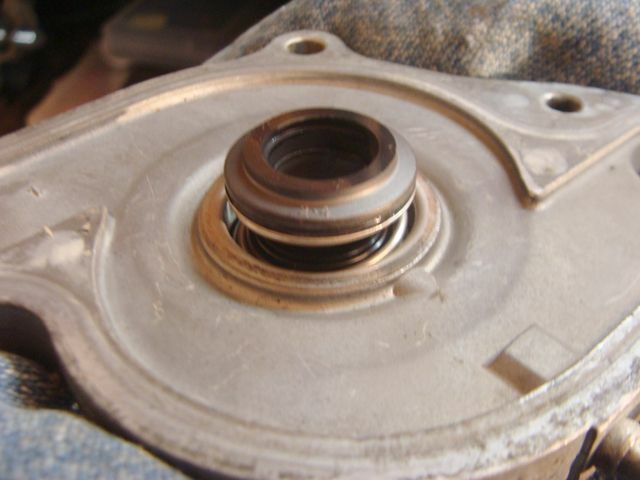 I slid the impeller through the seal and bearing. 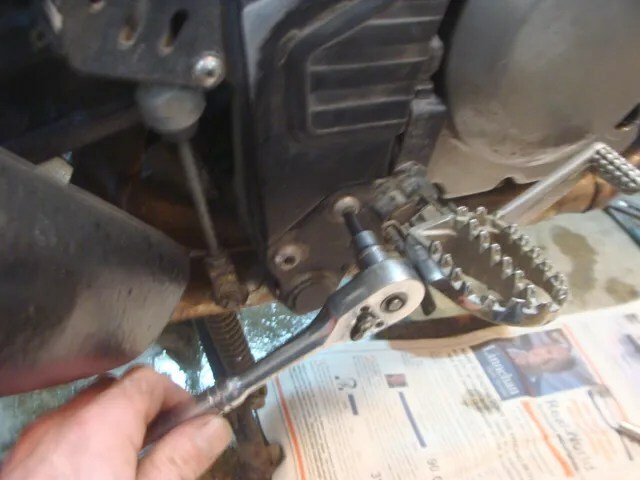 I snapped the e-clip on to the impeller shaft. 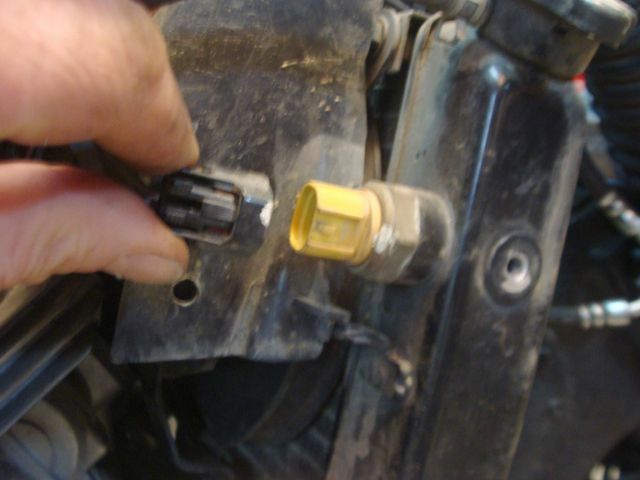 I removed the old pump housing o-ring…..
….and installed a new one. 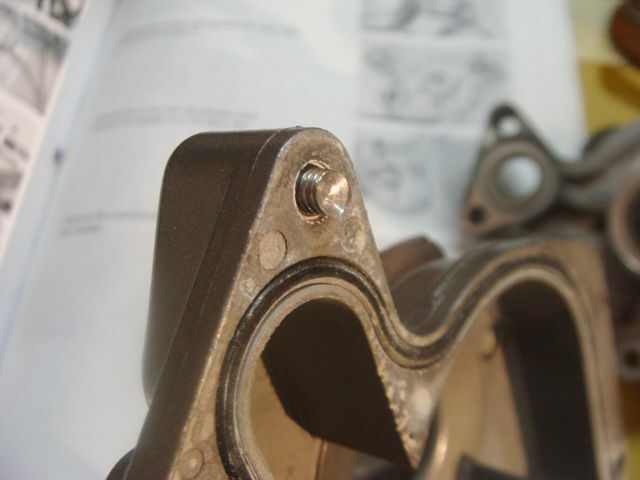 I coated the smaller o-rings with motor oil and installed them into the housing. 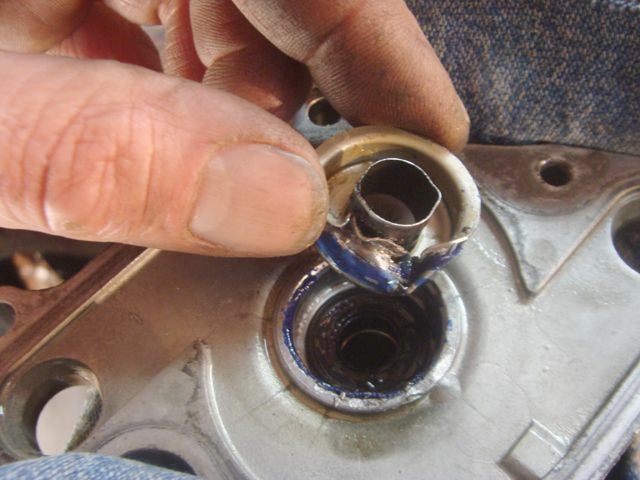 I smeared coolant over the o-ring that provides the seal to the two halves of the pump housing. I put a little “anti-seize” underneath the heads of the two difficult to remove screws. 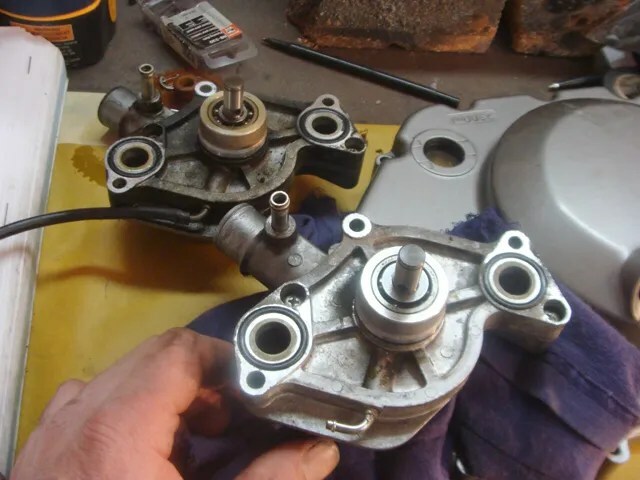 I placed the two halves of the water pump housing together…..
…and fastened them down tight. 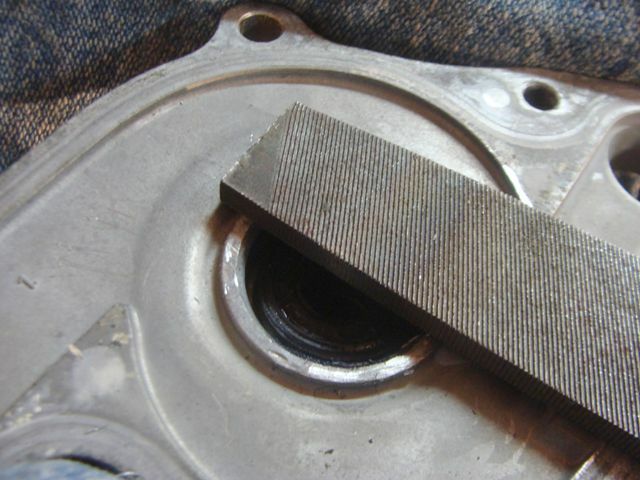 I “snapped” the water pump into the clutch cover. 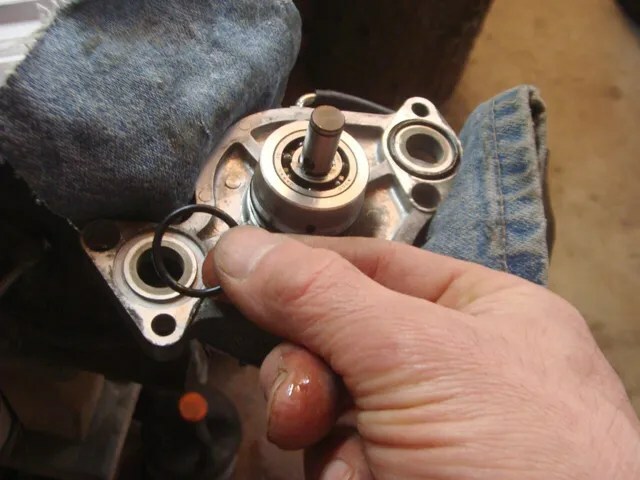 I filled the water pump bearing with motor oil. 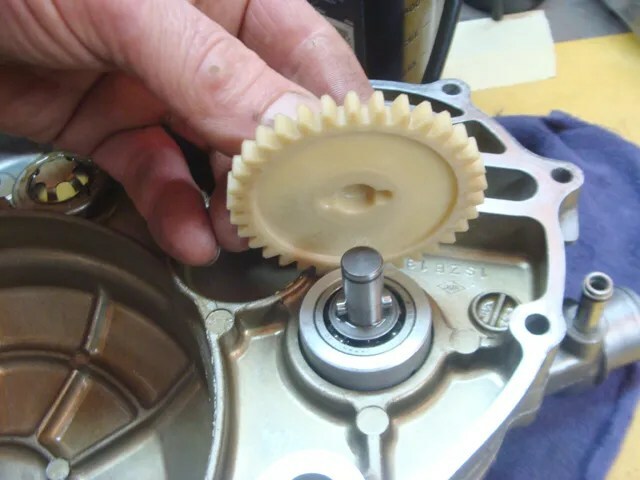 I slipped the flat washer over the impeller shaft. 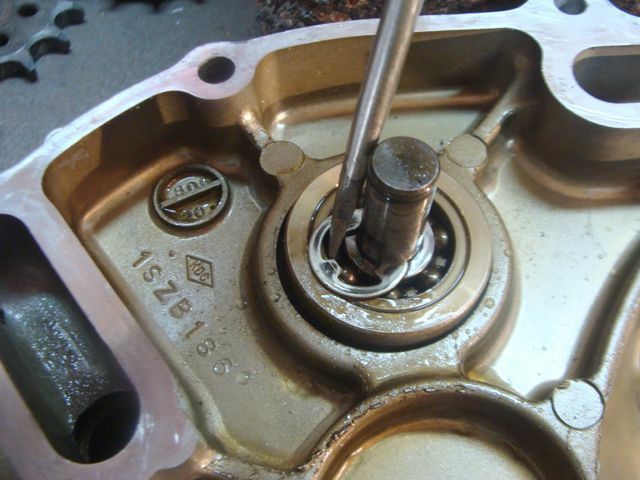 I slid the shaft pin through the shaft. 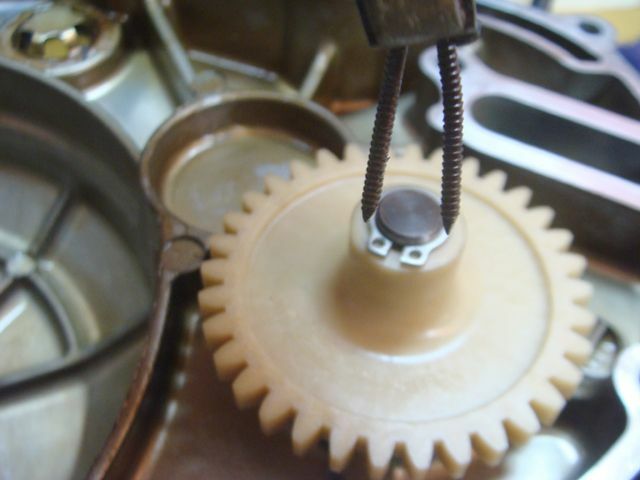 The underside of the pump gear has a slot that corresponds to the shaft pin. They lock together. 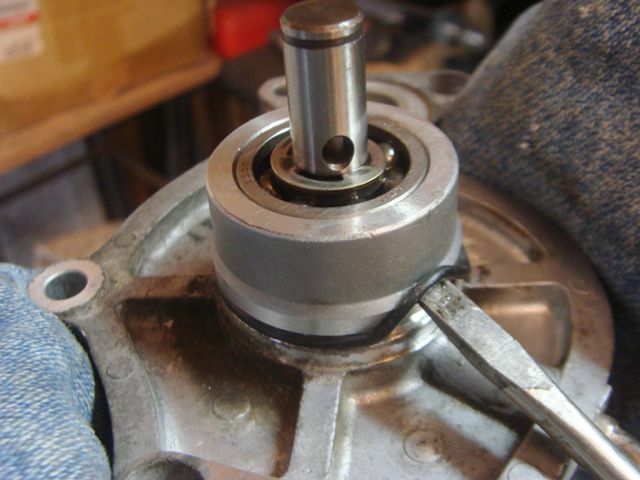 Using the same method that I used to remove the circlip, I reinstalled the circlip on to the end of the impeller shaft. 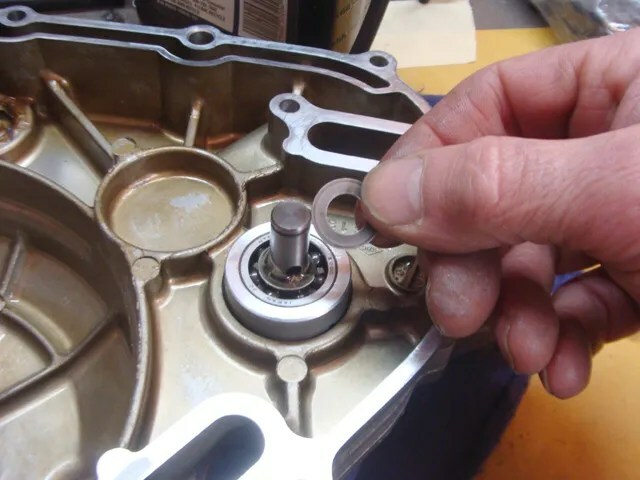 I placed a new gasket over the “drift pins” of the motor housing. 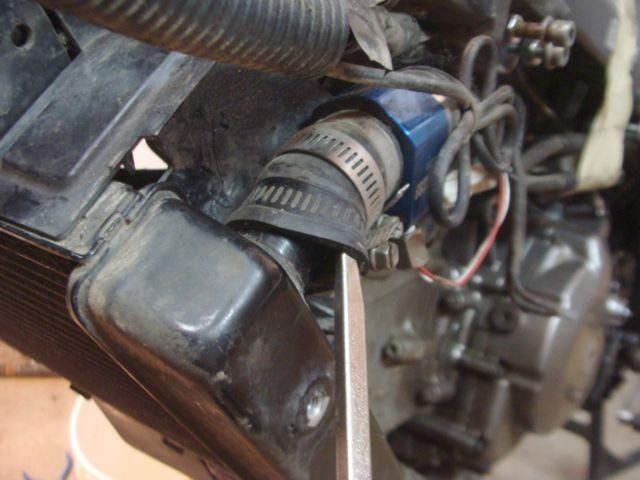 I installed the clutch cover to the motor housing, and hand tightened the screws. Once all of the screws were tight, I torqued them to the 7lb spec called for in the service manual. 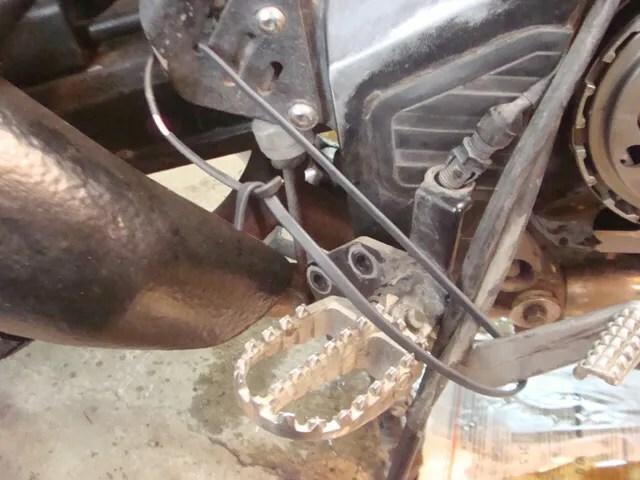 From this point, I added coolant, engine oil, installed my crashbars and skidplate. 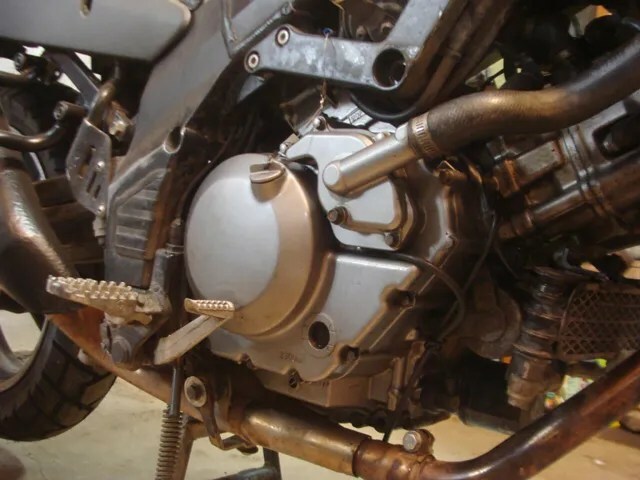 This is what the bike looks like fully back together. 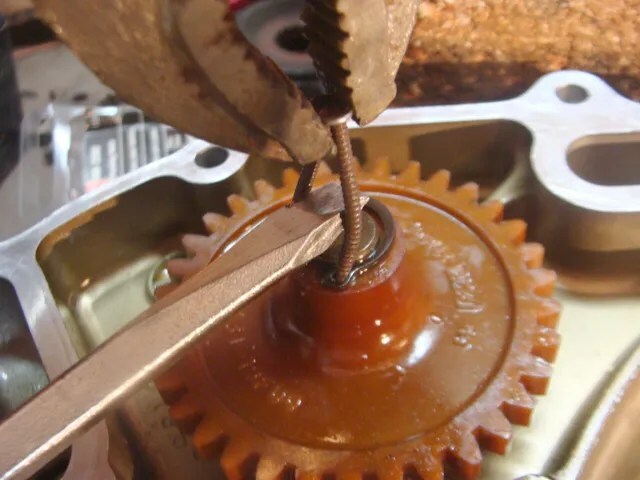 Your amateur mechanical abilities probably exceed many so-called pros – thanks for another detailed journey into this motor. I hope I never have to do this! Clicking on the job title to get to the meat of the post doesn’t seem to get anywhere. Clicking the date does it. That seems odd and hard to decipher. Hmmmm…… I think I am seeing and experiencing something different on my end, then what you are experiencing. 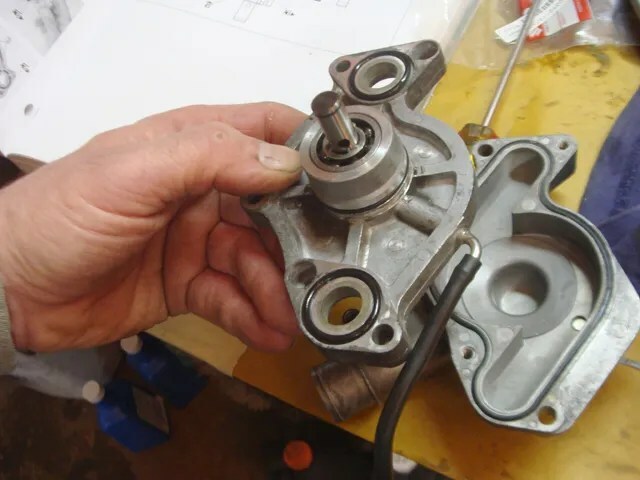 If I “click” on the Rebuilding The Water Pump article, from the menu on the lower, right hand side, (Under, “Motor Related”), I come to the article; but it is an abbreviated version. I have to “click” on the title again to get to a page where the article opens up fully. 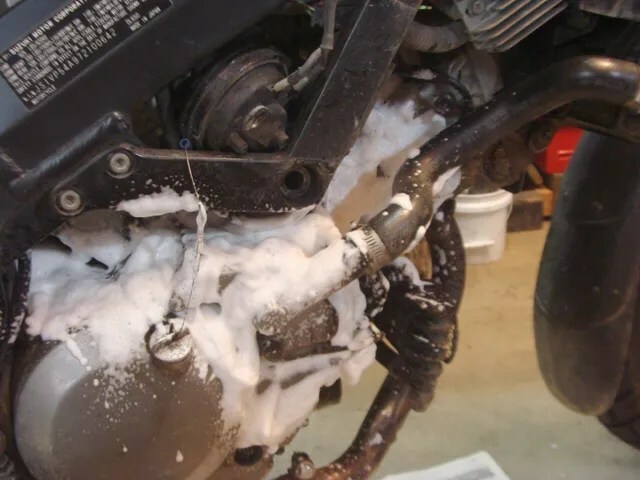 If I select the Water Pump article from the “Motorcycle Maintenance” list, (At the top of the page), I navigate “cleanly” to the article and it opens up fully. I don’t have an answer as to why this happens! By any chance did you try any of the other articles to see if they act the same way? And, if not, would you please do some “clicking” around the site to see if you can find similar situations as you have described. Nice write up! Did you figure out what the “WTIC #2” was? 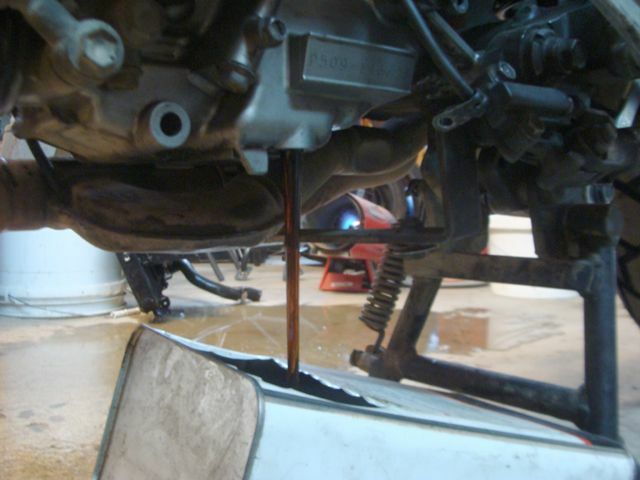 I have noticed recently that I have a small amount of coolant weeping from that hose. Right now I am the “what is broke” stage, trying to move to the “how do I fix it” stage. 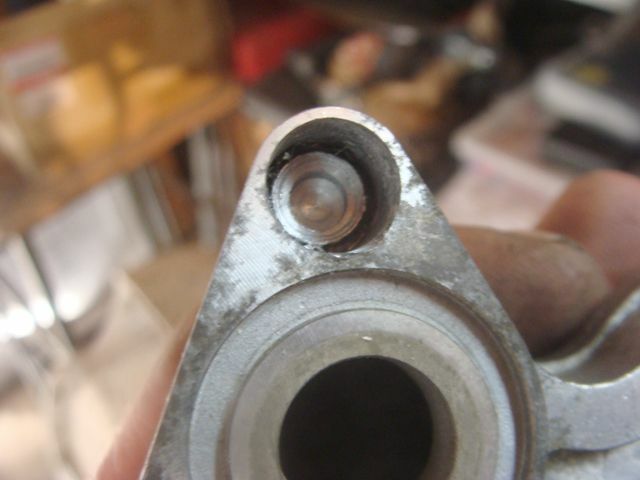 It looks to me like I may need to replace the Mechanical Seal? 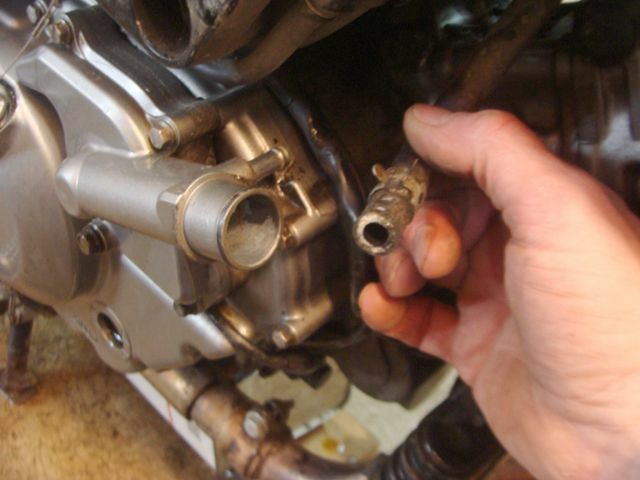 I believe that hose is a “bypass” hose…… I am no longer riding my DL-650. 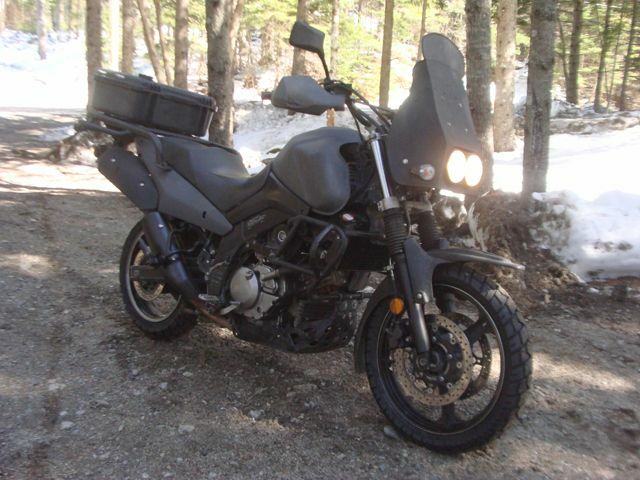 I am now riding a 1993 KLR 650. I just returned from riding it across Labrador and down the western peninsula of Newfoundland. Stories will come forth this winter! 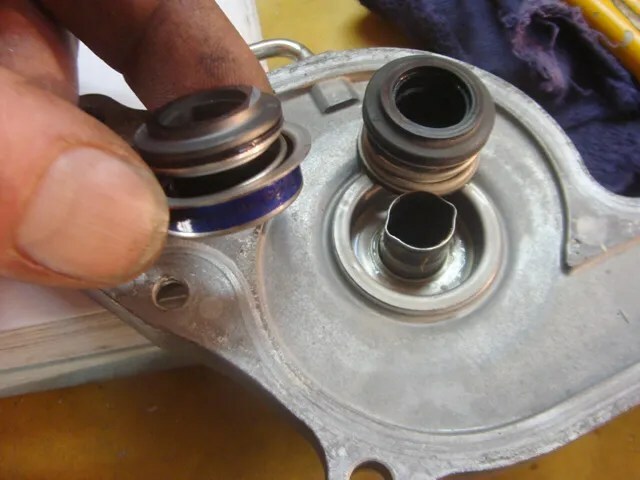 While you are “in there”, you will want to replace both the mechanical and oil seals. It just makes sense to do everything, (like I did), if you are taking the time to do the work. 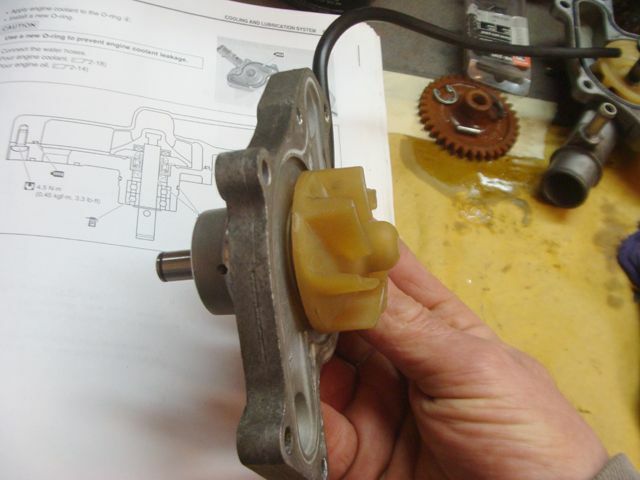 Incidentally, I was having no issues with the water pump. I just did the work to learn something new that I could then share with others.